In 2013, Thomas and Hutton, a world renowned engineering firm, reached out to General Sign to design a new sign system for one of their major clients, Stratford Land. 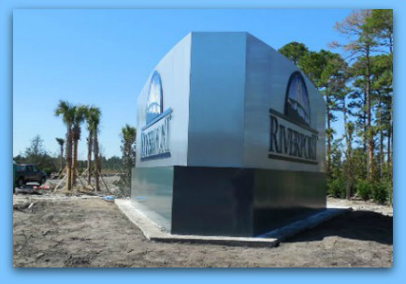 RiverPort, as the new development would be known, is a commercial distribution center in Hardeeville, South Carolina. Thomas and Hutton’s assigned engineer had a complex design already in mind when we were contacted. The sign would need to be an externally illuminated monument, with a radius top and constructed from brushed aluminum, along with a design parameter. Randy and Brad Ginzig oversaw this project from start to finish. What makes this project so interesting is the design. The total length of each side is twenty seven feet from edge to edge, but is constructed in a birdseye “V” shape. The design calls for a forty-two degree inner measurement from back to back. The total width of each vertex is twenty four inches due to the stepping up base design, but the sign area itself is only six inches deep. The sign is designed with an aluminum and steel construction. The inner portions of the sign are a combination of angle, steel, and square tubing to create the shape of the sign. Aluminum panels were brushed, then primed and painted with a clear coat to provide protection, and the base structure was sprayed a blueish grey paint to match the grey and blue of the logo. Careful thought was put into how the panels would be mounted to the structure. Welding was a possibility but would disrupt the continuity of the brushed aluminum. 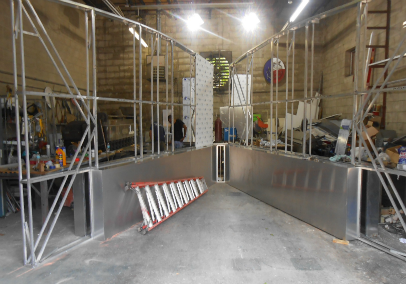 Our production lead, James Anderson, recommended the use of sunken, stainless anchors as a means to keep the anchors out of sight and to avoid any rust runs or other disturbances to the structure. The copy area is constructed from multiple materials. The Logo is sandblasted two inch cedar hand painted in several shades of blues, whites, and greys. The letters are fairly standard industry stalwarts in half inch thick, flat cut aluminum stud mounted to the structure. Both are sprayed matching blue and grey per the corporate logo and a clear coat applied. The underline and over line are both half inch thick aluminum stud mounted to the structure as well. The over line is interesting as it is constructed with a radius to fit the radius of the sand blasted logo. All copy was mounted the same one and one eighth inch off of the structure to provide depth. We loaded the sign onto a lowboy carrier, due to its size, and transported it in six pieces to Hardeeville, SC. On site, we dug and set mounting steel mounting poles in an engineered concrete spread footer on the first day. On the second day of installation we set the sign and its base onto the mounting poles and cleaned the surface. After installation, Thomas and Hutton brought in landscape developers to cultivate the entry aesthetic the client was looking for, and the finished project is incredible.